Alfred E. Neuman has always creeped me out the same way Howdy Doody creeps me out. 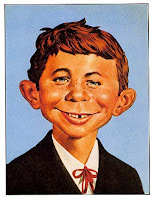 Many doctors have remarked that alfred e. neuman bears a striking resemblance to patients with Williams Syndrome, "a rare genetic disorder,occurring in fewer than 1 in 7,500 live births. It is characterized by a distinctive, "elfin" facial appearance, along with a low nasal bridge; an unusually cheerful demeanor and ease with strangers, coupled with unpredictably occurring negative outbursts; mental retardation coupled with unusual (for persons who are diagnosed as mentally retarded) language skills; a love for music; and cardiovascular problems, such as supravalvular aortic stenosis and transient hypercalcaemia."